Heat oven to 350°F. Place paper baking cup in each of 12 regular-size muffin cups. Let cookie dough stand at room temperature 10 minutes. In large bowl, break up cookie dough. Add lemon juice, lemon peel and eggs. Beat mixture with electric mixer on medium speed just until blended. Bake 18 to 20 minutes or until toothpick inserted in center of cupcake comes out clean. Remove cupcakes from pan to cooling rack. Cool completely, about 15 minutes. In medium bowl, beat powdered sugar, butter and 1 tablespoon of the lemon juice with electric mixer on low speed until mixed. Add remaining lemon juice, 1 teaspoon at a time, until creamy and smooth. Frost cupcakes. Use decorative cupcake liners to make your cupcakes even prettier. Garnish with a few blueberries, raspberries or thin slices of strawberries. 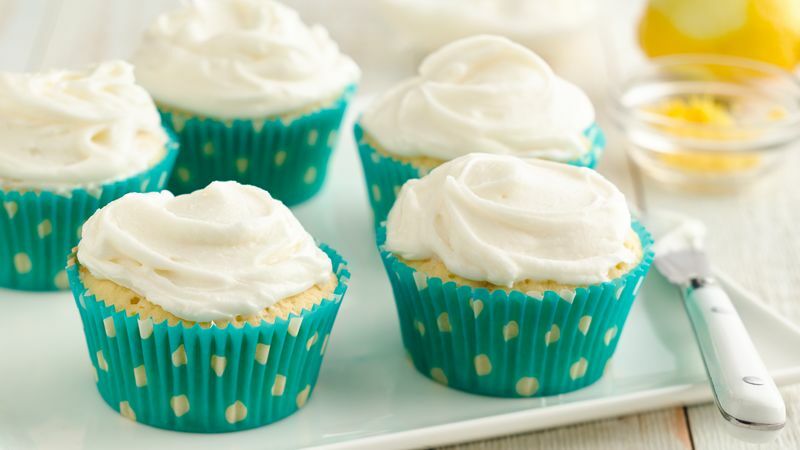 To save time, use a container of prepared fluffy frosting in place of the frosting in the recipe. You can stir in a teaspoon of grated lemon peel for lemon flavor. Tip: Lightly spray muffin tins with cooking spray before adding cupcake liners to keep them in place when filling with batter. More cooking spray tips.